This is a vegetable which is unknown to many, it is called khekhsa in Banaras, kakode in Delhi, ghee karela in Jharkhand and kakrol in Madhya Pradesh and asTeasle gourd in English. You wont find many recipe of kakrol, khekhsa or kakode on the internet but this is such a mild flavored vegetable that can be cooked the way you like. We prefer a dry stir fry with it mostly but another curry with lightly sauteed kakode and a paste of poppy seeds is a delicacy in Bengal. In my family it was always made into a bhujia or pakoda. First heat a tbsp of ghee in a pan and throw in 1 tsp of cumin seeds into it. When the cumin splutters, throw in the chopped shallots and kakode together (200 gm each kakode and shallots) Fry for a while, about 2-3 minutes, the veggies become a bit translucent, now throw in salt to taste and lots of pepper. Mix well and it's ready within 5 minutes. 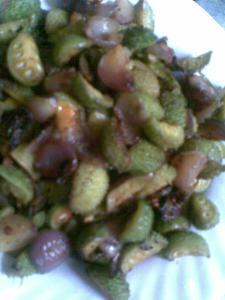 This stir fry of kakode or khekhsa tastes good with rotis or daal chawal as a mild flavored side dish. You can add some more spices to suit your taste but take care not to overpower the mild flavour of the vegetable. It is better to make another spice dish on the side if you like spicy food, this stir fry will be enjoyed by those who appreciate milder subzis. This reminds me of my childhood days in Orissa and my Cal days too. I dont like the big ones. This is called pagil in konkani, we make stir fries, sambar etc with this vegetable ...thanks for ur recipe seems easy n tasty. This is the first time i'm hearing about this vegetable.. interesting! never heard it b4.will try it. it is very expensive here in US. Get it rarely too! Great info dear. I too search for those tribal medicines:) They are very valuables resources and less known to the metro world. Thanks for sharing this yummy recipe. I can add one more recipe of pagil or kakode. Mske slices of kakode apply salt & keep at aside for 10 mts. 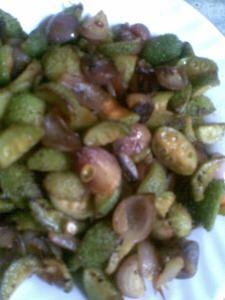 Pat this on a mixture of rice powder,salt,chillipowder, hing and deep fry them. i love it when you come and give more suggestions ....this recipe sounds great as we sometimes do it with bitter guards. 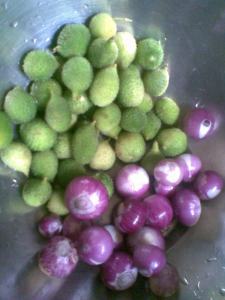 This is the vegetable introduced to me by my dad. Its very tasty and I love it. I usually buy them from tribals near mumbai..